Strings on Fire create an atmosphere of glamour and excitement, providing unique & unusual entertainment for parties, private functions and end of year events. Expect the unexpected as Sydney’s most unusual events duo ambush your party to enthral guests with a unique combination of violin and circus! It’s something totally different! The show can be Christmas themed or presented with the usual professional styling that Strings on Fire are known for. See the video below for our upbeat party show, “Baroque to Rock”. It is exuberant, high-spirited and good rollicking fun! Ask about our show formats – from short, impactful event openers to dynamic main feature presentations. Have pre-show entertainment packaged with a feature show. or Contact us to have Strings on Fire customise a show specific to your event. Award-winning shows for corporate events, cocktail functions & private parties. 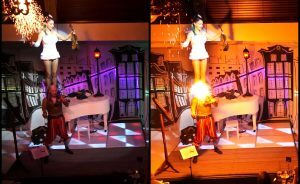 Mare and Nellie draw on their extensive performing experience to create a customised show for your special event. Whether you want a comedy presentation with quirky characters and audience interaction, or a stunning and sophisticated Cirque style presentation with full production, this versatile team can help! Turn your night into an unforgettable party! If you want to really ignite your next party or end of year special event, look no further! High Impact Entertainment that’s totally unique!